In 2016, home fires in the US caused 2,735 deaths and 10,750 civilian injuries.1 Fires can become life-threatening in just two minutes,2 so it’s important that each household develop and practice a fire escape plan. If your home has upper-level or basement bedrooms, emergency escape ladders are a critical part of this fire escape plan. We’ve reviewed the best emergency escape ladders for upper-level windows and for basement windows (sometimes called egress windows). Read on to learn more about these ladders and how you can incorporate them into your family’s fire escape plan. Looking for basement ladders? Skip down to see our recommendations. The X-IT ladder’s award-winning design blows the competition out of the water. It is lightweight, compact, reusable, and designed to fit on any window. When the ladder is folded up, its rungs nest together, which makes the X-IT compact and easy to store. Most importantly, the nested rungs prevent tangling and twisting, so the ladder will unfold properly in the event of an emergency. This is key because when you’re under duress, you won’t have time to fiddle and untangle rungs. The X-IT comes with a bright yellow storage bag so it can be found easily under a bed or in a closet. The grapple hook is designed to fit all window and wall dimensions as long as the window has a sill. If your window doesn’t have a sill, you should purchase the permanent mount bracket. The X-IT is the only portable window escape ladder that also has a permanent installation option. X-IT ladders are super lightweight—this two-story version weighs only six pounds. Weight is critical in homes with children because you want something your kid will be able to easily lift up to a windowsill if you’re not there to help them. This is a multiuse ladder so you can practice attaching it to the window and climbing down as many times as you need to. 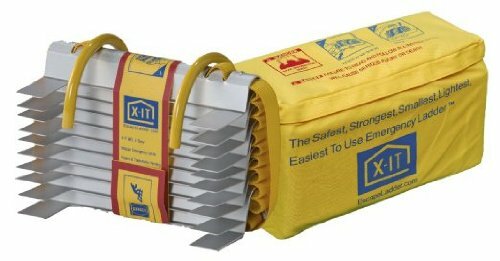 If you ever do need to use it in a fire, X-IT will replace it for free. X-IT ladders are also available for three, four, five, and six stories. Folded dimensions: 7.5 x 11.5 x 6 in. The Werner Fire Escape Ladder is permanently installed in the wall below the window. To use the ladder, you remove the cover and throw the ladder over the sill and out the window. This model can be used multiple times and is easy to deploy and properly repack without tangling. An installed ladder like this one guarantees that you always know where the ladder is—you can’t accidentally move or misplace it because it’s always right there in the wall. It’s also a good option for windows without sills because you don’t have to hook it onto a sill edge like portable ladders. This is also one of the best options for getting multiple people out of a window at once because the ladder can handle up to 1,200 pounds or 400 pounds per rung. Knowing it can handle that kind of weight is especially helpful for long descents down several stories. Some reviewers note that the sharp edges of the standoffs (the protrusions that steady the ladder against the wall) may damage siding, so you may want to attach felt or tape to the standoffs to soften them—just make sure the ladder will still fold properly into place. Werner fire escape ladders are also available for three stories. Folded dimensions: 18.5 x 15.25 x 3.12 in. 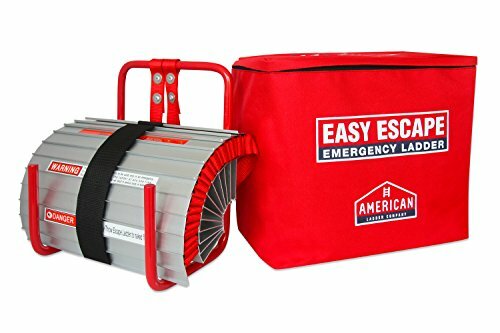 This escape ladder from American Ladder Company comes with a lifetime warranty. Like the X-IT, it’s portable and reusable, though it doesn’t pack up quite as small. Although it is portable, at 10.6 pounds, the Easy Escape may be too heavy for younger children to lift up to the height of the window. The window hooks have only 6.5 inches of clearance, so while the ladder will work on most silled windows, houses with thicker walls or brick on the outside may be too big for the hooks. Folded dimensions: 13.5 x 12.5 x 7.9 in. Ease of use: The ladder must be easy to set up so you can do it without thinking in an emergency. Kid-friendliness: If there are children in your house, you’ll need a ladder that’s lightweight so it’s easy for kids to lift and use on their own. Reusability: Experts say practice is critical for fire safety readiness, so you want a ladder that is easy to refold correctly so it will deploy properly when you need it. Permanent vs. portable: Do you need something that’s permanently installed or something that you can take with you when you move? Either way, you’ll want one ladder per upper-level bedroom. Standoffs: These are the protrusions from each rung that hold the ladder away from the side of the house. Standoffs are critical for steadying the ladder against the house and allowing enough room for a proper toehold. All the ladders on our list have standoffs. Length: Make sure your ladder is long enough to let you reach the ground without having to jump the last few feet. To easily measure the ladder length you’ll need, lower a weighted string to the ground, mark the window’s edge on the string, and measure the distance from the weight to the mark on the string. Ultra Protect’s EZ Escape Ladder comes in a variety of sizes (the one featured here has four rungs) and is guaranteed by a lifetime warranty. 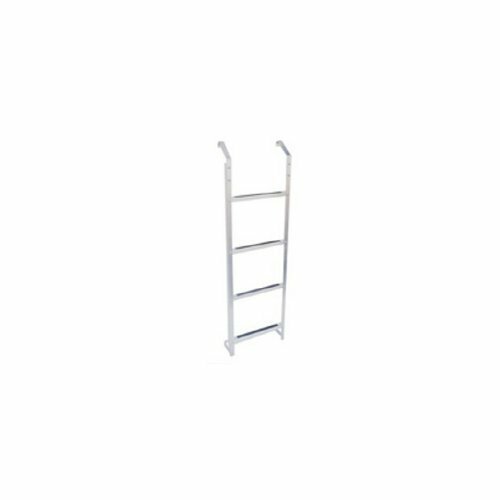 The ladder is made of lightweight galvanized steel tubing that’s sturdy enough to hold up to 300 pounds, and the rungs have nonstick tape for a secure foothold. This model hooks over the lip of a corrugated metal window well and secures with the included self-tapping screws, so no extra tools are required. Ultra Protect basement ladders are also available with two, three, and five steps. Size: 53 x 15.25 x 4 in. 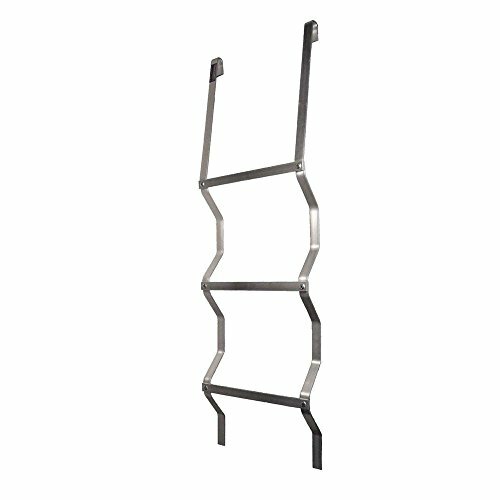 Like the Ultra Protect, this Adjust-A-Grate ladder is designed to hook over the lip of a corrugated metal window well. While it lacks a couple of the nicer features of the Ultra Protect, this is still a decent low-cost basement fire escape option. Unlike the Ultra Protect ladder, the rungs on the Adjust-A-Grate ladder are thin and do not come with anti-slip tape. You can easily buy and add anti-slip tape yourself, but it’s an extra step with only a $10 price difference. Size: 49.75 x 14 x 3.25 in. 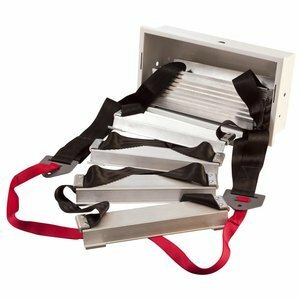 The Innerweld window well escape ladder is heavy duty and hooks over the lip of a metal window well. The design is slightly different than the other two options on this list, with vertical bars that lie flush against the side of the well and rungs that protrude. It also does not have anti-slip tape on the rungs, but again, you can easily add that yourself. Unlike the other two basement ladders, the Innerweld doesn’t require assembly, but that also equates a much larger package arriving on your front porch. The Innerweld is our third choice because it’s heavier, has a lower weight capacity, and is more expensive than the other two options on this list. Even so, the Innerweld is still a perfectly safe option if its design fits your needs. Size: 50 x 14 x 5 in. Ladder height: Make sure your ladder reaches from the bottom of the window well to the top, without creating a struggle to step up or out. Security: Your ladder needs to fasten securely to the window well. Most ladders are designed to work with corrugated metal wells, so if you have wooden or cement wells, you may need to purchase alternative mounting hardware. Non-slip rungs: Many basement ladders come with non-slip tape on the rungs, but if you purchase one that comes without tape or if the tape wears off over time, you can easily add tape yourself. Building codes: Most cities and counties have specific window size and ladder requirements for basement rooms being used as living spaces. 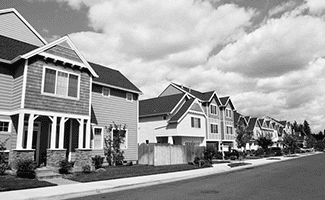 Search “[your city/county] egress window requirements” to make sure your home meets local specifications. Practicing fire-safe habits is the first step in keeping your family protected against dangerous situations, starting with maintaining working smoke alarms throughout the house. As a family, talk about steps you’ll take together to keep each other safe from fire—this is a great opportunity to get the kids involved. Experts at Ready.gov emphasize the importance of not just creating a fire escape plan but practicing it multiple times and on a regular basis with every member of the household. When it comes to upper-level ladders, each person should practice mounting and descending the ladder until they can do so naturally and confidently. For basement window wells, every person should know how to open the windows, take out screens, and ascend the ladder with confidence. If you have covers over your wells, make sure they can be easily opened from the inside. It’s recommended that as a household, you practice your fire escape plan twice a year. By practicing, you build muscle memory so that you can perform the motions confidently and intuitively, without thinking, in a time of duress. Because fires grow and deadly smoke can increase so quickly, it’s critical that anyone in upper- and lower-level floors can get out of the house as quickly as possible. Including quality ladders in your family’s fire escape plan could be the difference between a scare and a tragic loss of life. If you use these ladders along with smoke detectors and regular practice, your family stands a much better chance of making it out unscathed. If you want to learn more about preparing for non-fire related emergencies, read up on our coverage of creating an emergency evacuation plan, building an emergency food supply, and packing a 72-hour survival kit. Do you have any of these ladders in your home? How have they worked out for you?